A Young Woman Died In A Menstrual Hut In Nepal : Goats and Soda She was 26. Her relatives found her body in the morning. The prime minister of Nepal called the district to find out what happened. Dambara Upadhyay died alone inside this shelter. She was following the practice of menstrual exclusion that is common in parts of western Nepal: sleeping outside the home during menstruation. On Nov. 18, Dambara Upadhyay slept in a hut outside her house. 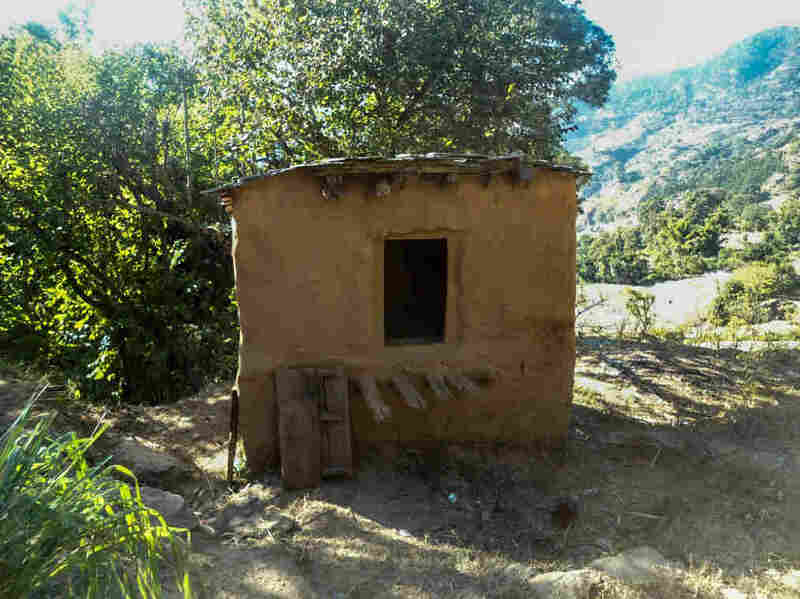 It's a common practice in some villages in western Nepal — women who are menstruating sleep in a small hut or shed out of a fear they will contaminate the home or anger the Hindu gods if they remain indoors. Many people in this part of the country believe family members or livestock will get sick, or even die, if a menstruating woman doesn't stick to the rules. The next morning, family members discovered that 26-year-old Upadhyay had died. Hers is not the first death related to the practice, but in an unusual step, the prime minister of Nepal put a call in to the district to find out what had happened. Upadhyay lived with her in-laws in the village of Timalsena in western Nepal's Achham district. She and her husband were just shy of their two-year anniversary; he was working in India. On Nov. 18, Upadhyay and her older sister-in-law, Nirmala Upadhyay, stayed up talking after dinner until 8 p.m., when the younger woman prepared to go outside for the final night of her menstrual seclusion. While unmarried women stay outside the home for up to a full week, married women typically observe the practice for just a few days. "We told her it's already three days now; it's enough. You don't have to go anymore, just stay at the house," Nirmala, 37, told NPR by phone from Timalsena. The younger woman replied that she had better stay one last night to ensure that nothing bad would happen. But something bad did happen. Sometime that night, Dambara died alone inside the shelter. Her sister-in-law found her body the next morning with blood coming from her nose. Shiva Raj Dhungana, an Achham-based journalist who reported on the case for Nepal's Gorkhapatra newspaper, says the shelter was locked from the inside and no foul play is assumed. Dhungana says local police suggested Upadhyay may have suffered from a heart attack, but the initial post-mortem report could not determine a cause of death. News of Upadhyay's death spread quickly through the village. "Everybody, women, men, everybody is saying they're not going to send their daughters and daughters-in-law to the shed anymore," Dhungana says. The Himalayan Times reported that the Ministry of Women, Children and Social Welfare is considering enacting a law to punish families who allow the practice, which is called chaupadi. Chaupadi has been outlawed since a 2005 Supreme Court decision, but there is currently no mechanism to prosecute anyone who adheres to the tradition. Since 2007, at least eight women have died in Achham while practicing chaupadi according to Bhagawati Aryal, a government employee who runs community programs in the district geared at changing beliefs about the custom through the government of Nepal's Women Development Program. Some of the reported deaths were attributed to wild animal attacks, while others were caused by fires or smoke inhalation from attempts to heat the shelters. In the nearby district of Jumla, Gyanashyam Nagarkoti works with his organization Surya Social Service Society to promote safe menstrual practices. But he's not aiming to change deep-rooted beliefs overnight. Instead, Nagarkoti's team goes for incremental changes, like persuading families to set up a secluded room for menstruating women to sleep inside the house. "Model families" in the village let their neighbors see that nothing bad has happened to them from making this change. Nagarkoti sees families shifting to the secluded room or reducing the number of days outside the home, but change is slow. At his own house, his elderly father still enforces the rule. But, "if me and my wife are the only people in the house, we don't follow this," he says. Nirmala Upadhyay says her sister-in-law's death has led to immediate changes in their household. "I don't know if God will punish us. I don't know what other people do, but from now on we will stay home. We're not going outside."